If you need to replace a roof due to storm damage or are having a new home built, a good material to use may be metal roofing sheets. Choosing a roofing material often depends on which area of the country you live in but metal roofing can be a good choice no matter where you reside. Here are six benefits of metal roofing sheets. When metal sheeting is compared with concrete or roofing tiles, metal sheeting is lighter. Most tiles weigh about 340kg per square, which is equal to about 30 metres. Concrete tiles weigh about 408kg per square but most metal roofing weighs about 23kg to 68kg per square. If the metal sheets are properly installed so they seal out water and withstand high winds, the roof should last as long as the house. Metal roofing also allows snow to easily slide off and it can resist mildew, rotting, and insects. It also has long warranties, with most manufacturers providing 20- to 50-year warranties for their products. If the metal sheets are painted, then a typical warranty is about 30 years. If you live in an area where there are bushfires, then a metal roof is more resistant to the flames than most other types of roofing material. Metal isn’t flammable so it can buy you and your family more time to get out of the house or it can protect your home until the fire department arrives to put out the fire. If you’re looking for metal roofing sheets and other roofing supplies, then you can find what you need at Paterson Supplies. Since most metal roofing is available in multiple-shingle sections or as wider panels, a roofing contractor can install it on your roof more quickly than most other materials. Also, since metal is lightweight, the roof doesn’t need as much support as it would under heavier materials like concrete, clay, or slate tiles. By getting the roof put up faster, you can save on labour costs and avoid bad weather moving into the area. Even though it is metal, the roofing material reflects the sun’s radiant heat, which helps to minimise heat gain during the hottest part of the day. The air conditioner won’t need to work as hard to keep your home cool, which helps to save on energy bills. The energy efficiency can also be increased by using the dead space between the metal roofing and the roof deck. Many metal roofing manufacturers offer their sheets in many colours. You can select a colour that best suits the exterior of your home or a light colour that can help reflect sun rays to increase the energy efficiency of the roof. Metal roofing is also cost-effective so you can save money by choosing it over other types of roofing that is more expensive and less energy efficient. 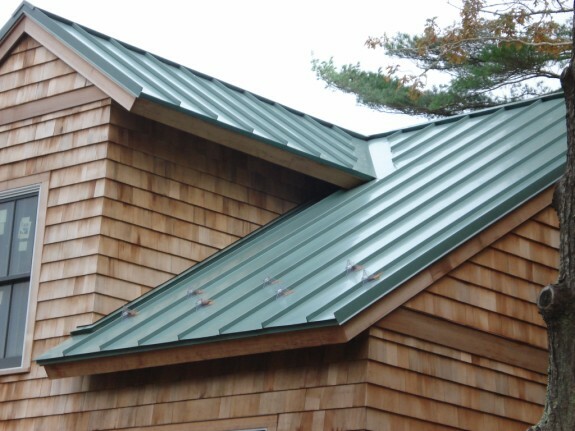 There are a few drawbacks but the benefits far exceed the disadvantages of metal roofing.